alaTest has collected and analyzed 872 reviews of Lenovo Yoga Tab 3 Pro 10-inch (2016). The average rating for this product is 4.1/5, compared to an average rating of 4.3/5 for other products in the same category for all reviews. People are impressed by the size and screen. The battery and usability are also appreciated, but some have doubts about the touch screen and portability. 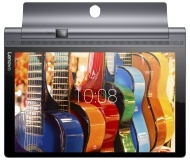 alaTest has collected and analyzed 23 user reviews of Lenovo Yoga Tab 3 Pro 10-inch (2016) from Amazon.co.uk. The average user rating for this product is 4.0/5, compared to an average user rating of 4.3/5 for other products in the same category on Amazon.co.uk. Reviewers really like the battery and screen. The usability and performance also get good comments, whereas many are critical about the portability and reliability. alaTest has collected and analyzed 2 user reviews of Lenovo Yoga Tab 3 Pro 10-inch (2016) from Amazon.ca. The average user rating for this product is 1.0/5, compared to an average user rating of 4.2/5 for other products in the same category on Amazon.ca. Does it really need a projector? With the Yoga Tab 3 Pro packed full of media-focused features and sporting a distinctive design, Lenovo is a solid UI experience away from creating a viable premium Android tablet alternative. Lenovo Yoga Tab 3 Pro Review: Lenovo's distinctive Yoga Tab family just got a new member, the Yoga Tab 3 Pro. It's an interesting beast to say the least. It's a shame about the software side of things and the projector, because otherwise the Lenovo Yoga Tab 3 Pro is a decent tablet. It has a fabulous screen, good all-round performance and battery life, and the speakers are amazing. The latest Yoga tablet is a gorgeous machine, but is it enough of an upgrade to be worth buying? The Yoga 3 Pro has clearly learnt from its predecessors, bringing the best to bear in a thin, light, generally terrific notebook.